Aegis: Guardian of the Fleet is a 1994 DOS computer game. It simulates command of a US Navy Ticonderoga class cruiser using the Aegis combat system, a US Navy radar and computer system which operates intelligence and missile guidance functions. It was developed by Software Sorcery, and published by Time Warner Interactive Entertainment. Players are given the ability to operate this ship in real-time, either from the bridge, or by viewing ship operations on radar, via the Tactical Plot System. Players can also command several ships at once. Players can play single mission games, or play a full campaign. The game depicts missions in the Middle East against a variety of targets, and with several different mission objectives. 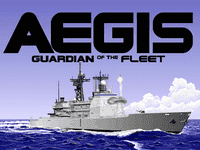 Source: Wikipedia, "AEGIS: Guardian of the Fleet", available under the CC-BY-SA License.